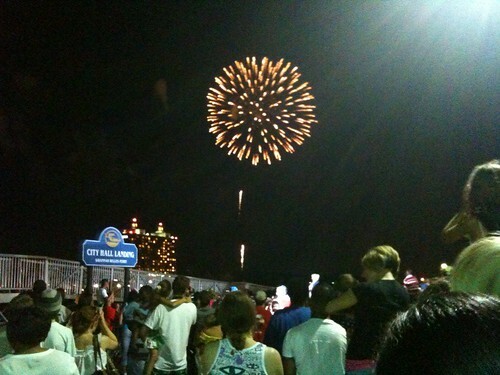 Watch the fireworks from River Street in Savannah. We still have room at two of our Savannah Vacation Homes over New Year’s Eve. Be spontaneous. Call a few friends, your sister, or your brother, and plan a Savannah getaway for New Year’s Eve. Broughton Street House is located in the heart of the Savannah’s Historic District. The weather in Savannah is expected to be sunny and pleasantly warm at the end of the year. With the mild temperatures, why not spend New Year’s Eve on the Savannah River? Savannah Riverboat Cruises is offering several options: the New Year’s Eve Party Cruise includes hors d’oeuvres, live entertainment, dancing, a cash bar, and champagne at midnight; the New Year’s Eve Gala has the above, along with a buffet dinner and a front row view of the fireworks; the New Year’s Eve Dinner has you back on land by 9 p.m., and is ideal for families looking for a special way to celebrate with children. More information is available at Savannah Riverboat Cruises. For an exceptionally romantic New Year’s Eve, try Alligator Soul. The menu is built around organic local and regional ingredients. The setting is unpretentious yet elegant; you’ll feel at home and you’ll feel pampered. Ele is another great choice for New Year’s Eve, especially if you enjoy Asian fusion. Dress your best for an elegant evening of delicious food, live music, and fun. Of course, spending a quiet evening at your Savannah Vacation Home with good friends or family may be just what you need this New Year’s Eve. Cook together in the kitchen, play games, and sit around the fire swapping best stories from 2011. Sometimes the “less is more” approach is the best way to spend New Year’s Eve.